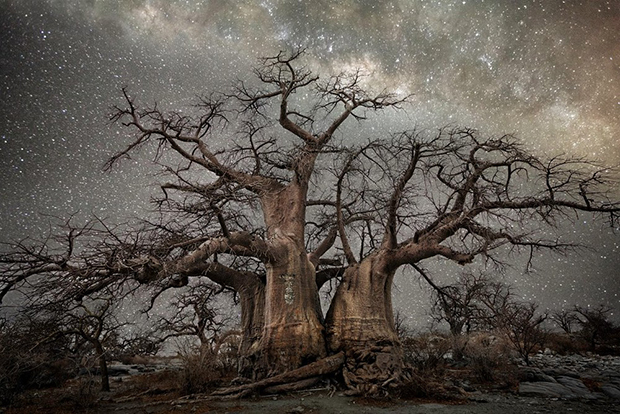 San Francisco-based photographer Beth Moon has spent more than a decade of her life hunting down our planet’s aboriginal trees, chasing them to their isolated and solitary bowers at the edges of civilization. 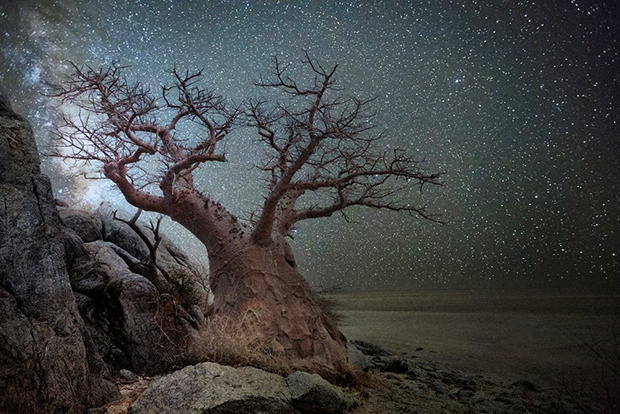 After devoting fourteen years to shooting ancient trees by day, the photographer embarked on Diamond Nights, for which she captured the looming plants under the black shroud of midnight and illuminated by a dusting of twinkling stars. 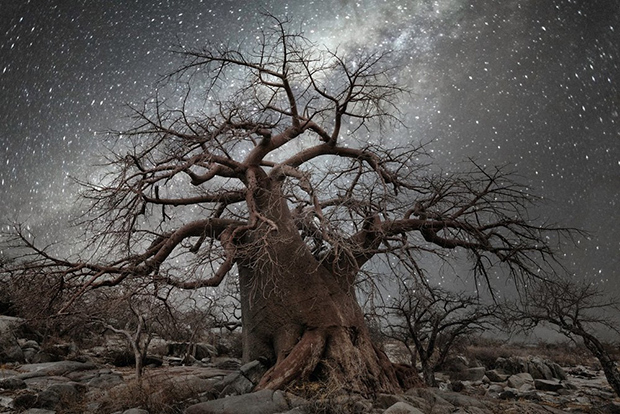 The seedlings for the project were first planted when Moon encountered various scientific studies that examined the bond between trees and starlight. The first, she reports, was conducted by the University of Edinburgh and finds that cosmic radiation has a profound effect on the growth of trees; the second, written by Lawrence Edwards, suggests that buds will transform in accordance with planetary movements. 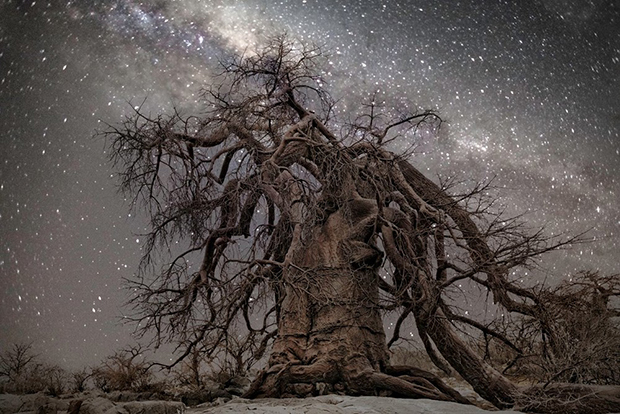 The ties between celestial bodies and trees, says Edwards, is strong enough that specific species will interact and align themselves with different planets. 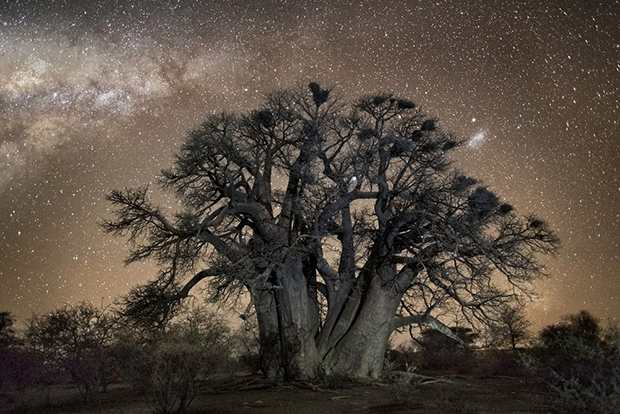 For Diamond Nights, Moon poured over research materials to locate intriguing trees throughout southern Africa, in South Africa, Botswana, and Namibia. In order to shoot under a clear sky, she sought out isolated and uninhabited areas, following a guide for hours across unmarked terrain. Setting out on a course with no roads—much less road signs—she journeyed for miles upon miles without seeing a single soul. 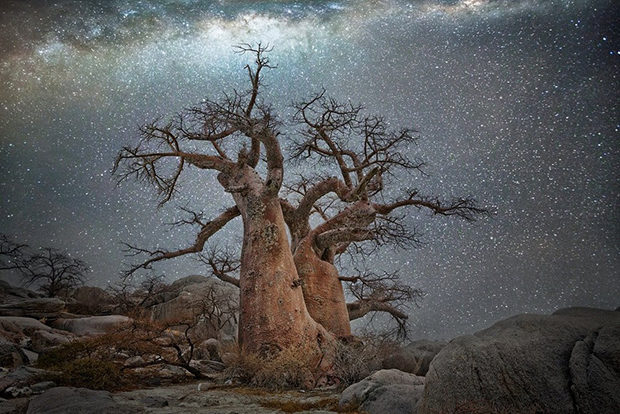 While some of the trees were labeled in some way, many were not, meaning that no one could locate them without knowing exactly where they stood. 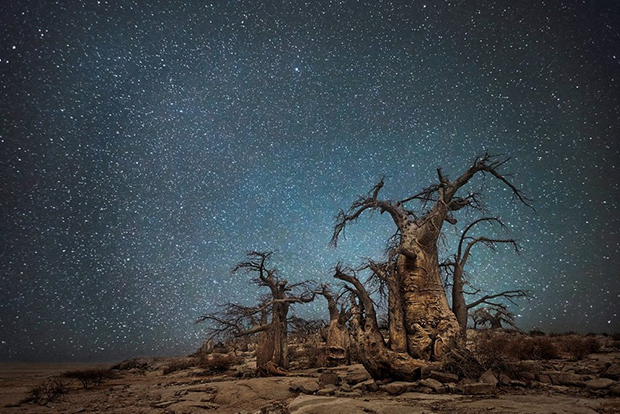 After marking her place during the day with a small collection of rocks, the photographer returned by night to each site carrying a flashlight. The darkness, she says, was so thick that she was unable to envision her own palm as it stretched before her, and her exposures lasted for about thirty seconds each. In that time, she allowed enough light to enter her camera but forced the stars to stay in place; any longer, and they would begin to form trails across the sky. 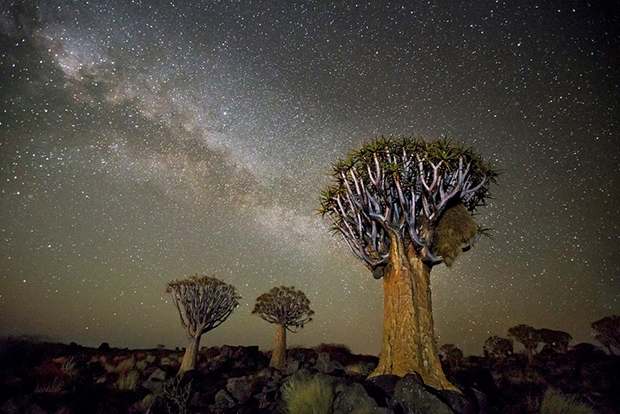 Standing in the presence of these trees was for Moon like diving into the depths of the ocean. She stayed with them for hours and in silence, witnessing their secret communion with the sky above. 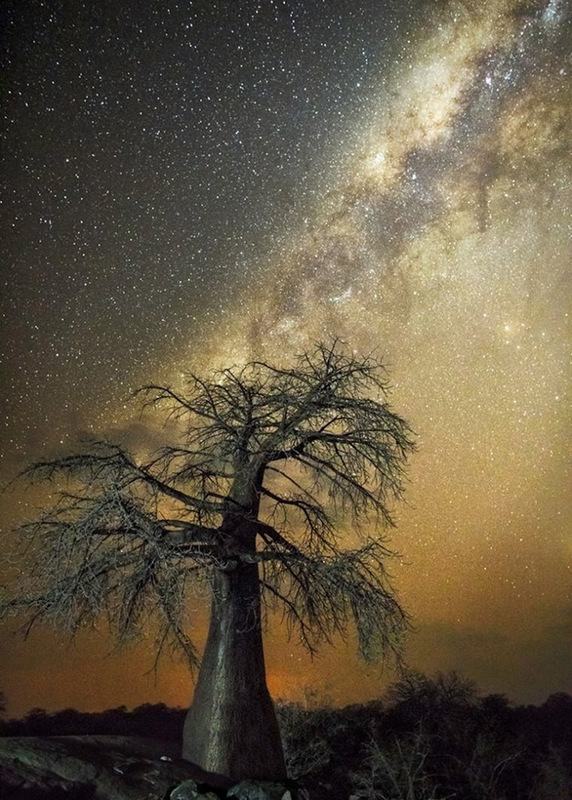 She titles each tree after the constellation rendered behind it, a quiet nod to the ancient Greeks and Romans who drew stories from the night. 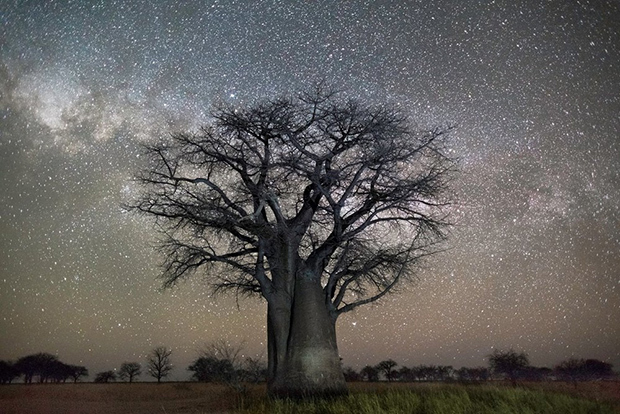 Through the silent whispers exchanged between the stars and the earth, the famous philosophical query “If a tree falls in a forest and no one is around to hear it, does it make a sound?” is at last answered, the trees’ reply wordless but no less resounding.